Floor tiles are often the perfect option in rooms like the kitchen or bathroom, where there may be too much moisture for wood or carpet. 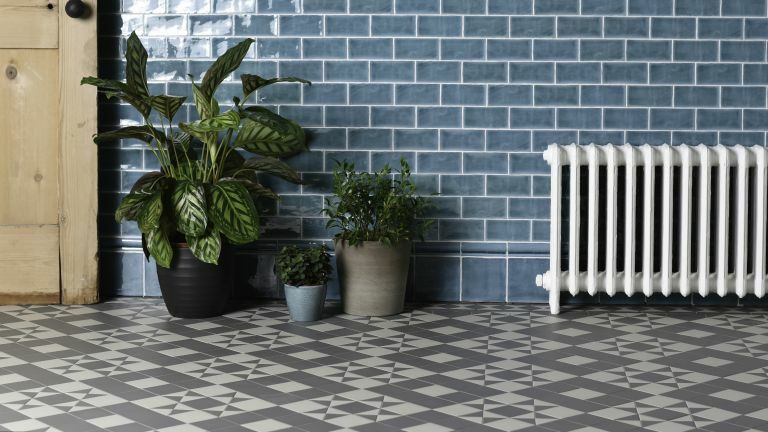 Whether you go for solid stones like granite and marble, handmade terracotta or quarry tiles or cost effective but stylish options like porcelain and ceramic, floor tiles could even be the right choice for living room and bedroom flooring, paired with a thick, soft rug. Take time to ensure your floor is even, ensuring that there are no bumps or cracks and that the surface is thoroughly cleaned, using a degreasing agent, such as sugar soap, if required. Make good any areas that are damaged before going any further and ensure the surface is completely dry before you proceed to the next steps. Wooden floors may need over boarding, concrete floors priming and uneven floors will need to be levelled before tiling with a suitable levelling compound. Refer to the adhesive instructions for further assistance. Depending on the type of tile and adhesive you use and the condition of your floor, you may need to prime the surface. Ask the tile manufacturer for what’s recommended for your particular tile. With chalk or a pencil, measure a centre mark between the opposite walls or units and draw a straight line down. Don’t assume that the opposite walls are equal in size, as a lot of rooms aren’t perfectly square. Repeat this by measuring the centre of the line that you draw. Lay the square onto the centre line and centre mark to draw a line 90° to the first line. Starting at the middle point, dry lay a row of tiles in both directions up to the wall and make sure you include 3mm tile spacers so the tile joints are even. If there is only a thin piece of tile left at the wall, re-arrange the centre tile so there is a larger section of tile, which will be easier to cut. Remember, leave about half a tile or more as it can be difficult to fit smaller sections of tile at the edge. You may need to remark your lines on to the floor to fit the setting out until it works. When measuring, make sure to leave enough room for the grout joint and sealant. When you’re happy with the layout, cut the required tiles, which will make laying them quicker. You can use a manual cutter for straight cuts, an electric cutter for more complex designs such as right angles and curves or a tile scribe for small, thin tiles. A manual cutter is used for straight cuts. To measure where the tile needs to be cut, place a tile on top of the last full tile, and mark with a pencil where the overlap is, this is where you need to cut. Make sure you leave enough room for the grout joint and movement joint. Movement joints must not be grouted, the use of a sealant would be recommended. Place the tile in the tile cutter, square it up to the plate and get the cutter and pencil mark in line. Press down firmly on the handle of the cutter, and push forward across the tile to score a line. Press and apply pressure on each side of the tile and it will snap into two pieces. Some cutters will have an all in one breaker built in, just put the clamp part on the tile and push down on the handle to snap the tile. If the cut isn’t clean and the edges are slightly rough, use a file or rubbing stone to smooth the edges. For smaller or curved pieces, use tile nippers to cut small pieces off to achieve the correct size or shape required. This method can be used on thinner tiles. Measure where the tile needs to be cut using a pencil alongside a metal ruler, draw a straight line across. Hold the metal ruler on the cut line to ensure a straight cut. Holding at a 45° angle, use the tile scribe against the side of the ruler, apply pressure and cut across into the glaze. Use a long thin object underneath the scored tile, such as a pencil, and apply pressure either end of the tile and break into two. Be careful of the sharp edges after cutting. If the cut isn’t clean and the edges are slightly rough, use a file to smooth the edges. Electric cutters are used for right angles, curved edges and thicker tiles such as porcelain and natural stone. Make sure the electric cutter has water in the tray as the blade will overheat; it also reduces the amount of dust produced when cutting. For curved edges, mark with a pencil the area that needs to be cut, and mark several lines up to the curved mark. This is because a tile can’t be turned whilst being cut. Using the electric cutter, cut the number of lines up to the curved mark so it looks like a comb. Draw round the curved mark with a tile scribe to score and cut into the glaze. Using a tile nipper, break away small bits at a time up to the curve, and file down until smooth. Before you start applying the adhesive, make sure you plan ahead so you are able to exit the room without stepping on any tiles. If the room is essential, you can tile half of the room at a time, so you are still able to access the room. Mix the recommended tile adhesive in a bucket according to the instructions on the bag. Then, working off your set out lines or from a straight edge, spread the adhesive on the floor, holding a notched trowel with a minimum 8-10mm notched size at a 45 degree angle and drag across the floor to spread the adhesive evenly, ensuring the notches are in the same direction. Only cover a small area at a time – approximately one square metre – as the adhesive will begin to dry once applied. Place the first tile on the bed of adhesive, press down and twist and slide it into place to ensure the adhesive sticks properly (for larger tiles, you may also need a thin layer of adhesive on the back of the tile to make sure they’re properly secured). Use a spirit level to check the tile is flat and insert tile spacers along each edge before repeating the steps as needed. If you’re using extra large tiles (anything larger than 60cm x 60cm) use self-levelling clips and wedges as well. Wash down the surface using a clean, damp sponge, as you go to keep the tiles clean of adhesive. Leave the tiles for three to four hours, or overnight to give the adhesive time to set. Then, to prepare the grout, which should be the right type for the tiles you’ve chosen, mix the grout powder with water in a bucket as required. It’s best to mix a little at a time to grout the tiles in batches, as it will harden quickly. Remove the tile spacers and clean the joints to remove any excess adhesive. Hold a grout float at a 45 degree angle and evenly spread the grout in between the tiles ensuring you have tiled the joint. Work in small areas to ensure you have enough time before the grout hardens. Once all the joints between the tiles are grouted, leave to dry for around 10 to 15 minutes before wiping the tile surface with a damp sponge, but don’t put too much pressure on the grout joints. You may need to wipe the surface again later to get rid of any residue. After another 60 minutes, when the grout has hardened a little, use grout profiler at a 45 degree angle and press down on the joints and drag across to take off any excess grout and smooth it off. Wipe the tiles again to ensure they’re completely clean. Finish with a silicone sealant around all the edges with a silicone profile and smooth the edges for a tidy result.